Orchard Park sits empty since 2014 and is not projected to be redeveloped until 2020. UC Davis is poised to submit its draft Long Range Development Plan for environmental impact review proposing insufficient housing for the enormous influx of more than 7,000 additional UCD students over the next 10 years. This is more growth at a faster pace than ever before. There was a time when the City of Davis and UC Davis had a relatively harmonious relationship. UCD brought jobs and prestige to the City and over time the City grew, as the campus grew. Many neighborhoods and apartment complexes were built throughout the city housing faculty, staff, students and others. But tensions have gradually increased around housing with the campuses continued growth, and lagging construction of on-campus housing. For example, in 1989 the City and the University signed a formal Memorandum of Understanding including the commitment of UCD to avoid rapid spikes in enrollment and to provide on-campus housing to avoid UCD growth impacts on the City. Over the years the University failed to follow through with their end of the agreement and the lack of on-campus housing has caused problems for students and increased pressure on the City. More than 70% of the current UCD student population lives off-campus – primarily in Davis. Greatly accelerated campus growth has come to have significant impacts on our community. At the November 16th UC Regents meeting, Interim Chancellor Hexter admitted UC Davis’s rapid enrollment growth is responsible for the “saturation” of the Davis housing market. Davis’s workforce and families are being forced to move to surrounding cities and commute to their jobs in Davis. Students have increasing difficulty finding housing and must double and triple up in bedrooms or commute in from out of town. In our traditionally single family neighborhoods where once there were 1 or 2 student rentals many more homes are purchased by investors and are often altered to have more bedrooms (sometimes legally, sometimes not) to rent to students. This shift is dramatically changing the character of Davis. UCD has announced on-campus housing plans that do not keep pace with their enrollment t growth further stressing the already tight housing market and putting students in very difficult situations. 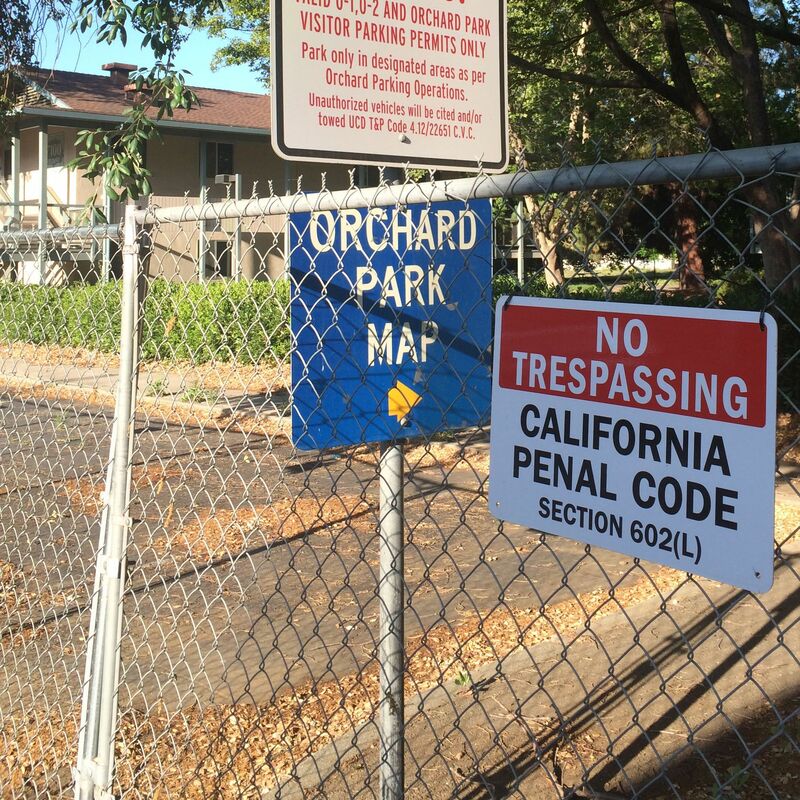 UCD’s November presentation to the Regents revealed that UCD will have no net gain in housing until the 2019-2020 school year, failing to accommodate increased enrollment, UCD’s Orchard Park apartments have been closed since 2014, and UCD is not planning to redevelop it until 2020. So, while UCD’s current plans fall appallingly short of its housing needs, UCD is bringing in 5,000 more students under its self-directed, “UCD 2020 Initiative”. Even the inadequate planned housing UCD s proposing will not be built in time to accommodate the thousands of students who need it. In August the Vanguard received this as a result of public records request from UC where they provided us with the latest figures, based on enrollment as of November 2015 and a housing survey conducted in December 2015 and revised in April 2016. New projects designed only for students are being proposed within the City. They are on a huge scale unlike what has been built in Davis before. These projects are 5-6 stories, and are primarily “rent by the bed” apartments. These “mega dorms” would greatly impact neighborhoods and our city infrastructure bringing significant associated costs such as wastewater and city services including police and fire. Not surprisingly, the proposals are meeting resistance from neighbors. Meanwhile, UCD itself is not willing to commit to building above 3 and 4 stories, complaining about increased cost. Meanwhile, Other UC campuses are receiving accolades for building taller buildings. Taller buildings and higher densities are more efficient uses of land and provide significantly more student housing and added bedrooms which recoup increased costs of taller construction. The Sierra Club, Yolano Group has submitted a strong letter criticizing UCD for its lack of sustainable planning, citing UCD’s need to build much higher density housing on-campus. UCD’s current planning practices are negatively impacting our city environment and carbon footprint by failing to build enough on- campus apartments to allow students to live on campus the entire 4-5 years they attend UCD. 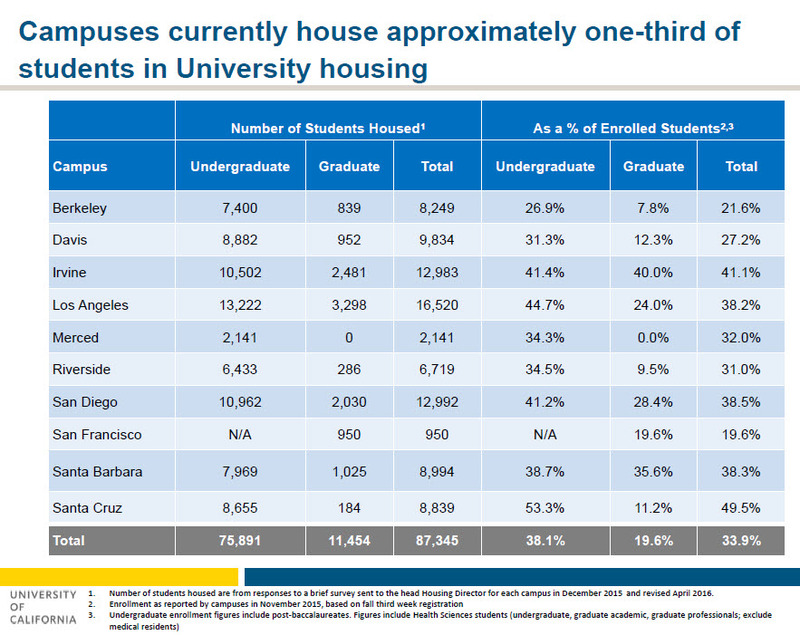 By comparison, UCD continues to lag far behind the other UC’s in its provision of student housing. Other UC’s are committing to providing housing for 50% of total student housing, UCD is only willing to try for 40%. While other California universities are providing housing for 100% of all new incoming students, UCD only aspires to 90%. Yet, UCD, at 5,300 acres, is the largest UC campus which has historically provided the least amount of on-campus housing. UCD can, and must do much more to provide long-term, and dedicated and housing for its students, as other much smaller UC’s and CSU’s have committed to do. If these other California public universities can achieve an adequate level of housing, why can’t UCD? UC Davis needs to provide on-campus housing for at least 50% of its total student population and 100% of new incoming students (as most other California public universities are providing). UCD needs to build higher campus housing densities, like other UC’s and CSU’s, with a minimum of 5-6 stories or more to implement sustainable planning and make more efficient use of land. Student housing construction timelines should be commensurate with UCD’s growth so housing is available as the student population grows. UCD needs to allow adequate time to complete discussions with the City regarding the unresolved on-campus housing deficit impacting Davis and surrounding communities before submitting the LRDP to environmental review or for approval by the UC Regents. And most importantly, please write to our City Council at CityCouncilMembers@cityofdavis.org to support their efforts to hold UCD accountable for the community and neighborhood impacts of UCD’s accelerated growth. But what about lagging off campus housing construction? What responsibility does the city have to plan for growth? I have heard the statistic Davis lags behind all other UCs in terms of on campus housing and does or will not build higher rise dorms but have not read WHY? And why UCD has committed to such increased growth. Were both these under the former chancellor’s watch and perhaps open to change now? It appears the World Food Center location is. “And why UCD has committed to such increased growth” ? I believe that I can provide a partial answer to this question only. In response to the policy which allowed out of state and especially out of country students who paid much more in tuition and fees than did in state students, many qualified students, including my own son, did not gain acceptance to UCD. I believe that although I did not actively participate, that there was significant push back on this policy leading UCD to agree to accept more California students. Unfortunately from my point of view, what they did not do was to consider that large growth in the number of students was also going to require commensurate growth in on campus housing for those students. I honestly have no idea why this was/is the case. and I believe this our of state/country admission and subsequent in state admissions were more true for UCD than other campuses? I don’t recall seeing those comparative numbers. Does anyone have them ? Having seen this same article, or close permutations of it, every day for as long as I have been reading the DV I admire the endurance of the commenters. I’m confused, this is the first article Colin has written for the Vanguard. So how have you seen it for as long as you have been reading the Vanguard? The verbiage and arguments all seem very familiar. Different author, same old story. LOL, I was thinking the same thing. I have my guess but I’ll keep it to myself. Can’t argue that. But do feel that the emphasis of the current article is enough different to warrant some repetition while acknowledging that everyone will have a different threshold. Quielo and Palin have noted the endurance of those who have written past commentaries on UCD’s lagging performance in providing an adequate amount of on-campus housing. There’s some reasons for this persistence. For one, many of us can envision a living situation that would be far more conducive to quality learning for the students. Being a student at a demanding institution like UCD can be a tough experience for even the most accomplished high school graduate. One only needs to look at the declining enrollment of UCD freshmen between the fall and spring quarters to get an appreciation of this dynamic. My neighbor’s nephew is majoring in engineering, and he’s told me how rough it is, noting that least one of his classmates was flunked out during the first year. I’ve had friends tell me how rigorous and demanding classes were for their college age children at other UC campuses, all the way through sophomore and junior year. For many, the stress does not abate until senior year. Given these circumstances, it would only seem logical that a good way to lessen the strain would be give students an opportunity to experience less stress by living within a few minutes away from classes and lecture halls. I think their energies would be much better spent having more time to study and interact with other students in a true college experience, rather than taking a big chunk of the day standing around at bus stops, pedaling to class from apartment buildings in the further reaches of Davis, or driving to campus from towns like Woodland, Dixon, and Sacramento. And, it would be far easier for them to use a campus dining hall instead of taking time to do grocery shopping. I constantly see students in my neighborhood walking or biking home struggling with bags of groceries. That’s something I had to do in grad school, but by then I was a little more experienced in balancing multiple demands. Some of us attended colleges and universities that provided on-campus residence halls and apartments for students all the way through senior year and saw the multiple advantages that such housing offered, and wonder why UCD seems incapable of doing such a relatively simple thing. It should not be that hard, especially for a campus that has so much acreage. Just last night I was at a holiday event in Sacramento and encountered a recent UCD retiree who said she was always puzzled during her 35 years at UCD why the university seemed so disinterested in providing housing for students. In some cases I’m familiar with, the absentee owners don’t live anywhere near Davis, and so have little to no vested interest in the long-term welfare of our community. They’re just trying to maximize short-term rental income, which would obviously be OK if the tenants were more mature and considerate of the neighborhood. After awhile it gets weary, leading one to naturally wonder if this situation would not be so likely to occur if the students were living in campus apartments among others with similar lifestyles. For example, you’re far less likely to disturb your neighbors if you come home from the library or lab at midnight if those neighbors are other students probably doing the same thing. Or, returning at 2:00 AM from a downtown bar, as the case may be. Bottom line, people like the author of the article above feel the way they do for a variety of reasons, but in most cases I believe it is because they envision a far different and hopefully better situation in Davis for the students, the neighborhoods and the ability of families and workers to find adequate rental housing. The concern is for the present, and the probable impacts on our town if UCD continues turning its back on the housing needs it is creating. The city is already providing housing for more than 60% of UCD’s students. And we are nevertheless short thousands of beds. The city is already providing housing for more than 60% of UCD’s students. UCD is short thousands of beds, and they need to provide them on campus. They have plenty of land to do so. The housing market is short thousands of beds. UCD needs to provide many on campus, as they have agreed to do. We need to provide some in town as well. UCD has not yet agreed to provide sufficient housing on campus, to meet their needs. You’ve previously acknowledged this. The city has historically provided housing for 60-70 percent of UCD’s students, and continues to do so. The recently-proposed student-oriented “mega-dorm” developments that are being proposed are unprecedented in size, scope, and impact on neighborhoods and the city as a whole. (Not to mention students, who would be forced to commute through the city, to reach the university.) Also, these proposals are not directed toward the groups that you’ve previously expressed concern about (e.g., low-wage workers – such as those who work at your business). Edison’s bolded words establish a premise and pose a question that lies at the heart of both the UCD experience and the UCD/City of Davis history. One way to look at that history is through a comparison of the population of Davis and the enrollment of UC Davis over time. What those historical numbers show is that since 1970 UCD and the City have grown at virtually identical rates. The City’s population grew 188% from 1970 to 2015 and UCD’s enrollment grew 167% from 1970 to 2015. The annual average enrollment growth of UCD from 1970 through 2015 was 2.205% (24.4% each decade). The average annual population growth of the City of Davis for that same period was 2.380% (26.5% each decade). The LRDP’s projected growth of aggregate enrollment growth of 6,870 from 2015 through 2027 is 19.9%. It isn’t that UCD is incapable of “doing such a simple thing.” It appears that they are simply continuing to execute on the model that has worked so well for them from 1970 through present. One question that I find myself wondering about on a regular basis when I think about student housing, is whether things would be different if UCD were a Liberal Arts college rather than a Research university. It’s good to see the city leaders pressing UCD to build more housing. Even more important will be canceling the master leases (when will that happen?) and establishing a process for monitoring that UCD follows through on their commitment. Whether it is 90/40 or 100/50, making sure they stick to that, given past history of broken promises, is paramount. However, even if they agree to 100% of new enrollees and a goal of housing 50% of the student body, we are way behind on providing apartments in town to meet the past enrollment. So what I’m really looking for now is for those who have led this charge for more UCD housing to also acknowledge the need for more beds in the community. That would require that they not obstruct apartment proposals. Urging modifications to better fit in a neighborhood is one thing; constant opposition to new rental housing projects is another. I have repeatedly heard that the city shouldn’t allow new housing until UCD commits to more housing. Well, UCD has made that commitment. We need more student housing on campus, and we need more rental housing in town. It’s time to stop holding the latter hostage to the former. Approximately 3 weeks after it has been scientifically proven that Hell has indeed frozen over. I am basically in agreement with this, but I would like to see actual construction boots on the ground either prior to or simultaneous with proceeding with student housing projects in town given the university’s history of not delivering on previous promises. An analogy… if the %-age that UCD needs to provide housing to accommodate (pick your number) % of students, including ‘growth’, should the City need to provide housing to accommodate the same % of those who work, including growth in employment, in Davis or its environs? Interesting question which clearly deserves more thought. My initial reaction is to respond, “Only if the university were willing to house the corresponding percentage of non students on campus since that would balance out your analogy. since that would balance out your analogy. Both UCD and the City have ‘deficits’ from previous failures to act… UCD much more than the City. Yours is a false “counter”-analogy… and frankly (although I’m not), patently ludicrous. There are UCD students living in Davis, in their parents’ home. Does that count against housing UCD students in the City? Of course not. People not connected to UCD are not allowed to rent housing on campus (including the West Village) does anyone know if there some law that requires this or if UCD just wants to keep single townie guys away from the coeds? More housing cost more money , more maintenance and more energy . In the last interview with Spark the UCD Interim Vice Chancellor Ralph Hexter stated that the conservative donors are more hesitant to donate money because the UCD Chancellor is gay . Using the Marina’s slogan “follow the money and learn the true” is the fact that Katehi who brought $ 1,000,000,000 to UCD is gone and new Chancellor is not coming soon with goal to raise another $ 1,000,000,000. Everything is about money . Even the gay chancellor. Further, the article from 2011 that Don is referring to is when the country was still trying to pull out of the recession and when the vacancy rate was relatively higher in Davis. UCD had a temporary opportunity to start planning for a long-term sustainable on-campus housing plan for the sake of the students, and surrounding communities. But let’s look at what UCD did instead of taking the opportunity to plan and put into action a long-term sustainable solution to its on-campus housing deficiency, particularly in light of its aggressive and ambitious growth desires. Even in light of the fact that UCD was wanting to cash in on bringing in 5,000 more students so rapidly by 2020, why did they not build significantly more and long-term on-campus apartments to accommodate these students the entire time they attend Davis (not just freshman dorms)? Even at this point there was a backlog need for on-campus apartments since UCD on-campus housing was primarily one year freshman dorms. So UCD decided to go for the “short-cut bandaid” instead of the long-term and sustainable solution of planning for its housing needs. Instead of planning long-term for a housing solution like UC Irvine has been and which is a huge success (apparently 44% of the total student population) UCD planned to continue pushing its housing needs onto Davis and neighborhood communities long-term. As they are trying to continue doing despite the fact that UCD has over 5,300 acres and can easily accommodate far more on-campus housing. There is no reason why UCD cannot achieve what other UC’s like UC Irvine are achieving to provide the on-campus housing for its own needs. This is what really started the whole problem. Speaking at the annual campus convocation, Linda Katehi, chancellor of the University of California Davis, said the campus plans to boost undergraduate enrollment by 20 percent over the next five years, adding 5,000 students. Prior to that the rental housing market in Davis had always been tight. But this exacerbated existing trends. A number of apartment buildings were built in the late 80’s and early 90’s, and that more or less kept pace with enrollment growth. Then apartment construction pretty much halted, while UC continued to grow — and then the rate of UC growth accelerated. That initiative was when Katehi announced the plan to focus on foreign and non-resident student enrollments, specifically for the financial benefits to the campus. There was no discussion by UC as to how or where these folks would be housed. The university’s housing plans were not adjusted, so far as I have ever been able to discern, to accommodate this increase. And then on top of that the political blowback from state legislators added another 1000 students to the Davis plans. The one thing UCD has adhered to is the enrollment increase that they planned. In fact, I believe they’ve exceeded it. So there is no question that UCD is the driving force behind the current rental housing shortage in town, and is having an impact on nearby communities as well. The problem is, city leaders never reacted to that component of the chancellor’s initiative. Local leaders like Rochelle and Don Saylor praised the initiative. Elected officials didn’t address the clear housing shortage that it created. There is no question that the university has not done its part in mitigating the impact of this. That said, any city that hosts a major university needs to provide for the impacts of that university as well. Whether you like the 2020 Initiative or not, it created a demand that needs to be partially met by local development. The continuous opposition to rental housing projects in town has exacerbated the rental housing shortage. You may not like the fact that UCD is growing, but we still need to deal with the consequences of that growth. And it isn’t a huge amount of housing that is needed locally if UC actually provides what they’ve promised. The point is, if they cover 90% of new enrollment, the city’s housing stock still has to absorb the other 10% (several hundred students). And there was still a previous backlog. Even if UC agrees to house 100% of new enrollments, that previous backlog is still there. We need a couple of big apartment project, or several medium-sized ones, or a whole lot of little ones. It would have been better to get going on this local demand issue in 2011 when the demand side of the equation changed with the 2020 Initiative. The constriction of the rental housing market is harming students, non-student renters, and homeowners alike. Well that is certainly a matter of opinion since it does represent one student that the city is housing that the university is not. I am however, not suggesting that they reckoning come down to individual students. You had presented % of students in your analogy and that was what I was going with. I agree that this would have been better. I also feel that it would have been far, far better if Chancellor Katehi and her leadership team would have considered the adverse consequences of her rapid growth plans on the surrounding community and planned adequate on campus housing commensurate with her ambitions. As I remember it Katehi was well aware that growth of the university would have impacts that went beyond the campus and invited Davis to participate but flatly stated that if Davis didn’t want to participate UC would move ahead anyway. Woodland decided it would provide lots of new housing. Sac wanted the World Food Center. Davis built Cannery and tried to build Nishi and several innovation parks plus build infill. Of course Measure R got in the way and now Davis is looking at huge construction projects some by out of town developers who are unlikely to give much back to the community. Also, since in a normal community, peripheral development is easier than infill we have seen the pushback created by restrictions on peripheral development that drive infill. The result is that Davis has a huge housing shortage. What I find interesting is that people want the city to tell the university to build more but the people of Davis are resistant to both peripheral development and infill in the city. In other words the people want the university to take responsibility but don’t want to take any responsibility themselves. It is certainly true that some see Measure R as being “in the way”. It is equally true that others see it as a democratic safeguard against what they see as excessive peripheral growth. I can see both sides of this issue. Of course, as a slow growth advocate and incrementalist by nature, I prefer to have Measure R as a preventative measure against development that is not widely supported by the community. Not sure how many times this needs to be repeated, but UCD is driving the need for student housing. Even if your interpretation of events is correct, UCD made a unilateral decision to forge ahead, without addressing the needs of its own students. Campus housing is better for all parties – the city, all residents, and students – who can thereby avoid commuting through the city. As you’ve noted, outside developers who are proposing large-scale, student-oriented housing within the city do not necessarily have the community’s interests in mind, and their proposals present significant problems/opposition (as discussed at length, on the Vanguard and elsewhere). (You have previously acknowledged some concerns, as well.) It seems that UCD is trying its best to continue avoiding taking responsibility for its own students, as well – as it’s done for decades. You can repeat it all you want but UCD isn’t going to solve the shortage of housing in Davis. You seem to forget that without UCD, Davis would be like Dixon. You want the benefits of living next to UCD but don’t want to take any of the responsibility. UC will share in the burden and let those with a realistic perspective that want to share in the blessings of being near a UC campus benefit. If Davis doesn’t want to share in those benefits and refuses to grow with the university there isn’t much UCD can do about it. UCD has as much obligation to house its students as Davis does. There are plenty of campuses in California that are “commuter campuses.” There is no reason why Davis can’t continue heading in that direction with UCD building what it can muster and perhaps even more under pressure. But the idea that UCD is going to be able to shoulder all the burden while Davis does nothing is simply unrealistic. UCD as the largest employer in Yolo County already has its people living in nearby communities throughout the region. That trend will continue whether Davis takes a share or not. All it means is that Davis will be an environmental paper tiger with plenty of people commuting by car from Woodland or West Sac or Dixon or Winters that could bike to UCD from Davis. Meanwhile Davis will struggle to support its infrastructure while densifying what little space it has replacing what was once a rural/suburban lifestyle with a self imposed pseudo urban one. How do we know without UCD, Davis wouldn’t be Fairfield, Vacaville, Woodland or West Sac? Most of your arguments circle back to an expansion of borders, even as one of the largest developments in years continues to be built (the Cannery). Isn’t that a tautological argument? After all, isn’t the only reason that college students live in Davis, because we have a university? Sorry for the duplication of my posting. Earlier I was trying to relocate the posting to the correct location after Tia’s comment when I got a family holiday phone call. I just realized that I had already posted it earlier but in the wrong location. On repetition, thanks for the smile. I will forgive yours and hope you will do the same for me. On several occasions I have been distracted, come back and resubmitted what I previously posted. In this charitable time of year, may with both be forgiven. I am so glad to see this much neglected topic finally finding some coverage in the Davis Vanguard. > finding some coverage in the Davis Vanguard. Cannery is a drop in the bucket compared to what is needed. How many homes has Woodland built since Measure J? Its built thousands and has plans for thousands more. Many of those are occupied by people commuting to Davis and many more will be occupied by commuters who can’t or don’t want to pay the massive premium generated by Davis’ growth restrictions. Not really democratic as the voting population is skewed by the fact that those who live on campus can’t vote in the city. One problem with the drive to build more housing on campus is that it further exacerbates this skewing. Of course you do but what is the calculus of your incrementalism? As x goes to zero prices go to infinity and good people leave to live elsewhere who we should embrace. Woodland and Fairfield are county seats. This provides a bit of commerce and economic activity that Davis doesn’t have. Vacaville has long had a major prison hospital and a major USAF airbase and now is a biotech hub anchored by Genentech that Davis turned down. Of course Genentech wouldn’t have wanted to come here, only to get turned down, if not for UCD. Solano County also has better water because Yolo didn’t want to buy into Monticello Dam. West Sac is to Sacramento what Kansas City Kansas is to Kansas City MO. Many big cities have places like that across a boundary or river. Without UCD what would Davis be? It would be a farm town with a major railroad junction and probably more warehouses and distribution centers but likely fewer than Woodland. It would be a town like Dixon that captures revenue from being along an interstate from gas stations, fruit stands, wrecking and trucking yards and fast food joints. It would be like Dixon or El Mira that long ago lost its passenger train service. Actually, a bit of a medium junction. If we are going to address the calculus of incrementalism, should we not also address the calculus of rapid growth ? The part of the equation that you are not addressing is that if building were to “go to infinity” we would no longer even recognize the community of Davis having turned it into a cookie cutter of every other rapid growth community. Now you might not mind that, but I believe that the majority of our residents ( probably even the students if they could see beyond their 4 years here) would not knowingly choose to destroy the character of Davis. However, that will be the outcome of unbridled growth. So my question for you in this calculus is, having stated that The Cannery is “a drop in the bucket” how large is that bucket in your opinion ? What is the actual amount of growth that you see as appropriate and what if any limit would you favor for our population ? I think Woodland built 4000 homes in spring lake and plans several thousand more. If Davis built half as many it would help a lot since many of those people work in Davis. Many think Covell Village would have been the end of the world but if it had been built the housing situation in Davis would be in much better shape today. Then if you add a bunch of apartments within the preferred 2 mile biking distance from campus and UCD built more we would be in much better shape on housing. It would not be the end of the world. It would be different but not the end of the world. We could also build south of town but away from Richards out by old Davis Rd. you probably wouldn’t even notice that development.